On behalf of a collaborative effort of several local organizations, The Indian Classical Music Society of Vancouver is proud to present the return of the PadmaShri Gundecha Brothers to Vancouver, BC after two long years. 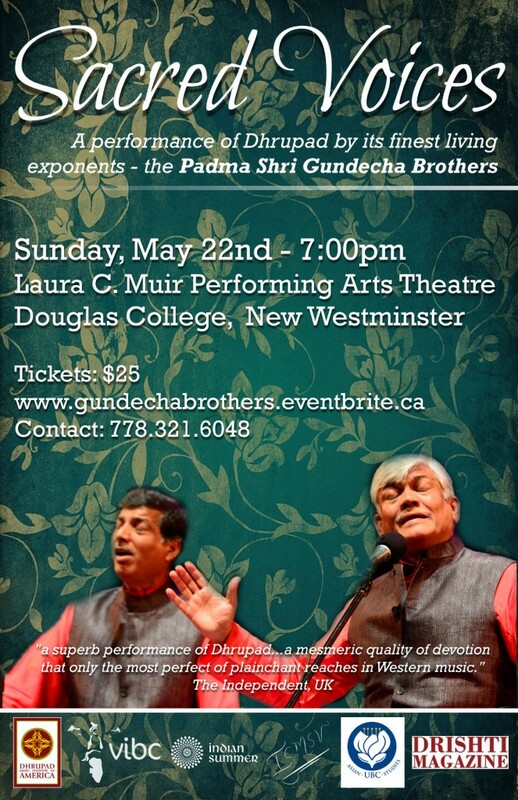 Join us on the evening of Sunday, May 22nd at the Laura C. Muir Performing Arts Theatre (Douglas College, New Wesminster) for a transformative musical experience as the Gundecha Brothers transport the audience into a realm of melodious devotion. Vocal masters Umakant and Ramakant Gundecha are the leading exponents of the Dhrupad style of music. They are among the most active performers in Indian and international circuits. They were conferred the title of “Padma Shri” in 2012 by the Government of India for their contribution to the field of Dhrupad and Indian Classical Music. They are accompanied by their brother, Akhilesh Gundecha, who has learned the art of Pakhawaj percussion from Pandit Shrikant Mishra and Raja Chhatrapati Singh JuDeo. He is a Post Graduate of Music and Graduate of Law. The Gundecha Brothers have sung great Hindi poetry by Tulsidas, Kabir, Padmakar, Nirala Dhrupad style. They have recorded about 50 cassettes and CDs by H.M.V, Music Today, Rhythm House, Times Music, Sony, Senseworld Music, Sundaram Records, IPPNW Concerts Berlin, Navras and Audio Rec London. As well as being an integral part of India’s prestigious music festivals, the Brothers have also performed and conducted workshops at many important international music festivals and institutions in about 25 countries in Europe, U.S.A, Australia, Japan, Egypt, Singapore, Bangladesh, U.A.E and Hong Kong (Courtesy: dhrupad.org).